Survey shows 78% of Indian 2Wheeler riders do not recognise even half the road signs! New Delhi, January 24, 2017: In continuation to its efforts to inculcate road safety measures in Indian 2Wheeler riders, Honda Motorcycle and Scooter India Pvt. 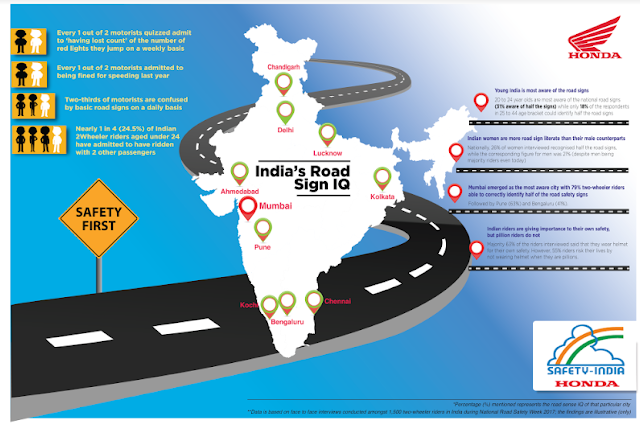 Ltd. (HMSI) undertook a mammoth nationwide ‘Honda Road Sign IQ Survey’ with an objective to understand the level of awareness of road safety signs and behavior of two-wheeler riders in India. ◾While India is the World’s biggest two-wheeler market… but road sign literacy of the nation remains low! •According to Honda Road Sign IQ survey, 78% of Indian 2Wheeler riders cannot recognise even 50% of the road signs! •Within the cities, Mumbai emerged as the most aware city with 79% two-wheeler riders able to correctly identify half of the road safety signs, followed by Pune (63%) and Bengaluru (41%). •The survey re-affirms the need for greater Education within the 3Es of Road Safety (Enforcement, Engineering & Education) as nearly 80% of Indian 2Wheeler riders are still un-aware about the difference between cautionary and mandatory road signs. •As more and more women are now becoming empowered riders, Indian women are more road sign literate than their male counterparts. Nationally, 26% of women interviewed were recognised half the road signs, while the corresponding figure for men was 21% (despite men being majority riders even today). ◾Educated young India leads awareness of road signs, though by a small margin! •Within the age groups, 20 to 24 year olds are most aware of the national road signs (31% aware of half the signs) while only 18% of the respondents in 25 to 44 age bracket could identify half the road signs. Interestingly, 30% those over 45 of years could also identify half the signs. •Indian riders are giving importance to their own safety! Majority 63% of the riders interviewed said that they wear helmet for their own safety. Enforcement by state authorities (16% admitted they wear a helmet to avoid fines) and family insistence (due to family pressure another 16% wear helmet) are the other two biggest motivators for Indian riders to wear helmets. •Most Indian riders understand importance of a helmet but only when they themselves ride a two-wheeler. 55% riders risk their lives by not wearing helmet when they are pillions. •51% of riders interviewed said they have neither fined nor did they jumped a red light in 2016 but risky riding still continues as 30% riders admitted to red light jumping 1-2 times a week. •Multiple engagements for all age groups including safety rallies, walkathons, safety banner displays at central locations of cities, drawing competition and safety quiz for kids, virtual riding simulator trainings for young adults and distribution of safety leaflets among public. •Spreading the awareness, nearly 10,000 Indians took ‘I am a Safe Rider’ pledge with Honda. •Honda spreads its Wings beyond the obvious metros to include 250+ cities across India from Coimbatore (Tamil Nadu), Bhuj (Gujarat) and Barwani (Madhya Pradesh) to Dhamtari (Chhattisgarh), Dhule (Maharashtra) to Guwahati (Assam), Sringar (Jammu & Kashmir) to Nagarcoil (Tamil Nadu). •Leading the road safety cause from the front, Honda 2Wheelers is the first two-wheeler brand in India to adopt 11 traffic training parks across India (Chandigarh, Ludhiana, Jaipur, Delhi * 2, Bhubaneswar, Cuttack, Yeola (Nashik), Hyderabad, Indore and Coimbatore. During the week, Honda educated close to 6500 individuals at its traffic parks. •Many unique engagements across India included an awareness rallies in multiple cities where in more than 850 customers spread the message of safe riding on their Honda motorcycles and scooters; awareness walkathons in Delhi and Bhubaneswar; helmet awareness rally for pillion riders in Delhi. Additionally, Honda’s safety instructors helped close to 7600 riders improve their risk prediction ability on roads with the riding simulators during the National Road Safety week.